Spacious three-bedroom villa in excellent condition. Modern colour palate, new floor coverings to living areas, renovated bathroom, good sized kitchen and quality appliances. Very tidy and ready for you to move straight in. 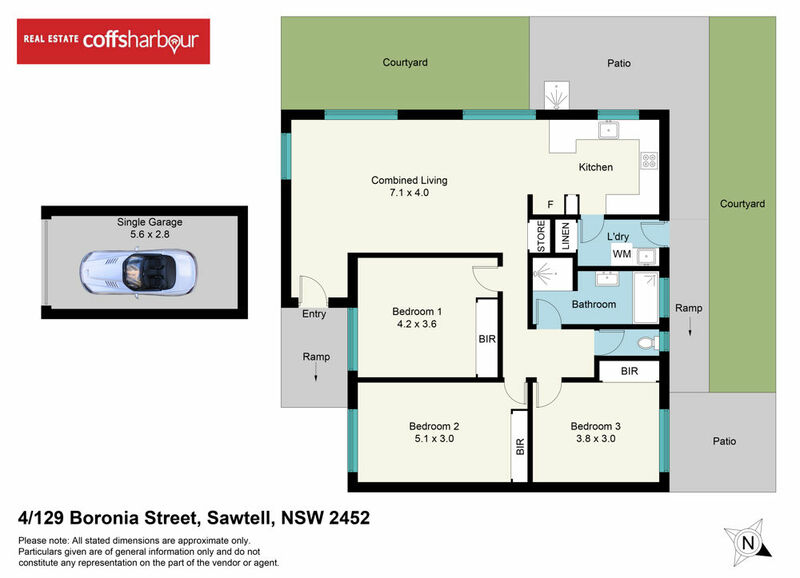 Short, flat walk to beach and Sawtell Village. All living areas on one level with easy ramp access. Views to Sawtell Golf Club fairways and Middle Creek. The open plan kitchen – dining – lounge is serviced by a reverse cycle air conditioner and there is plenty of natural light and ventilation. All bedrooms are well-proportioned and have built in robes and ceiling fans. Bathroom has full size bath and large shower. Toilet is separate. Located in a quiet, well maintained complex of four, this villa is well worth an inspection. Bus stop is close by. Short drive or bus trip to major shopping centre. Great place to live or fantastic investment opportunity.